I'm one of the few people around my part of Western New York state who actively pursue gar all spring and summer. I would love to know how long that 17lb gar was, if you have any other information. Considering that gar are about half the weight of a northern pike of similar length, a 17 pounder is an absolute monster. I've seen several in the five foot range, but they are few and far between. One of the few charts I could find calls a 17 pounder about 53 inches. That is a great fish. Thanks for sharing. Author of "The Ghosts of Autumn" 2016 and "The Ultimate Guide to Kayak Fishing" 2017. New book in 2018, just released is "Strong is the Current: A Grieving Father's Meditations on Life, Loss and Fishing" (West River Media). that we guesstimated at 15 pounds, just for reference. It was pretty thick and chunky too. I bet a 17-pounder would stretch to 55". I went back and reread the press release and a couple other news articles on this fish and the length was not given. Too bad but it did give the location of the catch and a. Few other details. I suppose a fellow could contact the Maryland DEC and ask if they measured it. It is listed as a new state record already on that web page. 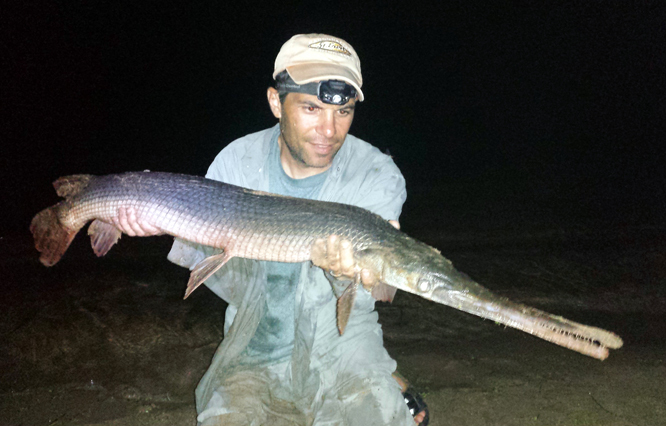 I don’t think I’ve ever caught a longnose gar. I’ve caught some shortnose below the old dam at Palisades State Park near Mt. Vernon Iowa. They can be pretty aggressive too. I pitched a leopard frog into a pool below that dam and watched him head for land. He did not make it. That was about a three pound shortnose that looked like a torpedo in clear water. The May 2018 fish is the only gravid female longnose I've ever caught. I've seen a few, but this one actually came out of nowhere and grabbed the rope fly from in front of another large female. She was only out of the water for a second. I have my GoPro set to take photos every two seconds. I lift the fish out, let the camera take a frame or two, and then right back over the other side of the kayak. Enjoy. You’re a good man and your concern for the welfare of this and other fish is appreciated by all sincere sportsmen. Thanks for sharing the photo. I checked the Iowa longnose record the other day. A little north of 20 lbs! We have caught, measured, and weighed a couple dozen 50-54" longnose in Wisconsin. I have caught three 17# longnose. that were 51 to 52". My longest longnose was 54.75" was 16.5 lbs. There is a lot of variance in girth and we've never got any gravid females because we generally dont catch them until late summer. My brother caught a 54.5" longnose that was 19.5 #.